The mysteries of Glastonbury Tor are not only in its legends but have a physical dimension, openly displayed. The hill is presumed natural, but anyone can see that at one time it has been shaped. Around its sides are several tiers of well defined terraces. They stand out most clearly when the sun is low, but can be seen and walked at anytime. It had always been supposed that the terraces were made by early cultivators, for growing vines perhaps. In 1964 they were seen in an entirely new light by an Irishman, Geoffrey Russell. Twenty years previously he had experienced a vision in which he saw a bilateral figure of concentric rings and understood it to be an image of the brain. 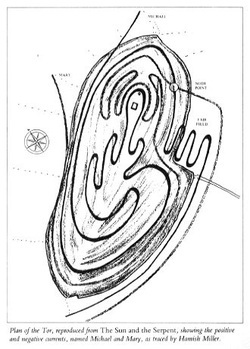 Later he came across a diagram of the Cretan labyrinth, as carved on a rock in Tintagel, and recognized it as the figure he had seen in the vision. Labyrinths thereupon became his full-time interest. The subject is notoriously gripping, for the symbolism of the labyrinth is powerful upon a variety of levels. It is generally agreed to be a plan of a journey, a pilgrimage to a world – centre sanctuary such as Jerusalem, and on a deeper level it depicts the pilgrimage of the soul through life, death and rebirth. When Plato in the Republic tells of a journey through the afterworld of a soldier who had been left dead on a battlefield, he describes the path of a labyrinth. 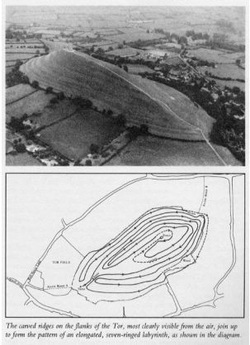 When Russell first saw the ringed terraces on Glastonbury Tor he recognized in them the form of a great three-dimensional labyrinth. A survey was made of the Tor and a model of it was constructed, from which it could be seen that the rings were seven in number and joined up to form a continuous pathway towards the top of the Tor, accurately reproducing the twists and turns of the seven-layered labyrinth which symbolized the classical Mysteries. A discovery of this scale could not immediately be assimilated by archaeologists and Glastonbury scholars. Moreover, like all discoveries at Glastonbury, it came through revelation, which is not a popular medium among the professors. Yet many discerning people have now accepted the reality of the Tor labyrinth; the evidence for it soberly summarized in a booklet by Geoffrey Ashe, and the plain fact of it can be seen by anyone who cares to follow its winding course up the Tor. In view of Glastonbury Tor's ancient character as Spiral Castle, centre of the Mysteries, the discovery of a spiral labyrinth around its Tor should not be surprising. The interesting question is when it was constructed. The earliest tribes were wholly concerned with keeping their landscape in the same state of nature as they found it. No doubt they regarded the Tor as a place of initiation, but they are not likely to have engraved marks upon it. The labyrinth, then, must have been carved after the time of settlement, from about 4000 BC. That places it within the age of the giants. It is indeed a typical product of that age. Even though it was always before everyone's eyes, its gigantic scale long hid it from perception. It should perhaps be called the Giant's Maze. 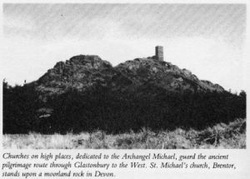 Another gigantic and archaic work involving Glastonbury Tor is the alignment of sanctuaries known as the St Michael line. Geographically it is the longest line across land that can be drawn over southern England, extending from a point near Land's End in the far west to the eastern extremity of East Anglia. On or near its straight course lie major St Michael sanctuaries of western England: Glastonbury Tor, Burrowbridge, Brentor, Roche Rock, St Michael's Mount, Carn Brea. This alignment is basically a work of nature. Many of its markers, such as the Tor and St Michael's Mount are natural features, but in some period of prehistory the line has been made precise and formal. This is demonstrated most clearly by its central section, beginning at the 'Mump' in Burrowbridge, about twelve miles south-west of Glastonbury. It is a smaller twin of the Tor, a ringed island hill with a ruined church of St Michael on its summit. From the top of the Mump the Tor is visible on the far horizon. The axis of the Mump is aligned on the Tor; its extension marks the old Pilgrims' Way along the Tor's ridge and forms the axis of the labyrinth. Further east the line runs precisely to the main southern entrance to the prehistoric Avebury temple. So it has been calculated by the mathematically adept and obliging Robert Forrest. This straight line continues beyond Avebury to a once important monastic site, the church at Ogbourne St George. St George is said by mystical writers to be the earthly counterpart of St Michael. In this central section of the St Michael line at least one site is artificial. Avebury is a formal temple, a structure of huge erect stones enclosed by a massive bank and ditch. It was formerly approached by two avenues of standing stones leading to minor temples. The Avebury temple is said to have been erected in the third millennium B.C. It was built within a landscape which nature designed as an Elysium, and it had always been a place of assembly for the early tribes. They held an important yearly festival on Windmill Hill above the Avebury temple. One thing was, however, lacking at Avebury. There was nothing in its landscape which fittingly represented the world-centre mountain. 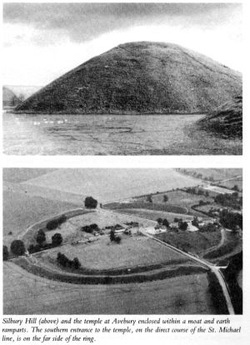 That deficiency was made good by the erection of Silbury Hill, 130 feet high and with a base covering 5½ acres. It is not just a great pile of earth but was made permanent by an inner structure of chalk blocks weighing together some million tons. The hill was built at about the same time as the temple and was related to it symbolically and in ritual. Michael Dames in his two books on Avebury and Silbury shows how the natural features and monuments of their neighbourhood formed a miniature sacred landscape, designed to accommodate all the seasonal rites and festivals throughout the year. This indicates that the temple and megalithic complex at Avebury were laid out within an existing sanctuary at a time when the old life of tribal wanderings across a wide countryside had given way to settlement. The year-long tribal pilgrimage was maintained, but on a geographically reduced scale. By priestly art the circuit of spirit shrines around the country was reproduced in one small area, around Avebury. That area became the microcosm of a whole country, inhabited by all its principal gods. Thus it became possible to enjoy the benefits of settlement while continuing to celebrate an annual series of festivals as in ancient times. The difference was that all the festivals were now held within the national Elysium. 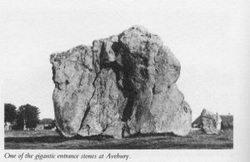 When the Avebury temple was built, its southern entrance stones were placed accurately on the St Michael line. The alignment already existed, being defined by Glastonbury Tor and the Mump of Burrowbridge. The Mump is presumed to be a natural hill, but certain features of its shape, location and composition suggest otherwise. It is greater in size than Silbury, which is claimed as the largest man-made hill in Europe. If it is artificial, the Mump must surely be one of these unrecognized works of the giant forces commanded by ancient priests. Further to the west, on the south-east edge of Bodmin Moor, another great landmark stands on the direct course of the St Michael line. The Cheesewring, a towering stack of huge granite slabs balanced one on top of another, is located on the summit of Stow's Hill within a prehistoric stone enclosure. Around it are ancient burials and stone circles. There has long been dispute about the Cheesewring, whether or not it is an entirely natural formation. It is difficult to see how nature alone could have contrived it, but it is too vast and rudely shaped to be the unaided work of men. Like the Mump and the maze on Glastonbury Tor, the Cheesewring seems to be a product of the age of giants. The association with giants which occurs along the St Michael line suggests the presence of earth forces. According to a book recently published, the existence of a geomagnetic energy channel on the course of the line can be detected today and was evidently known in the past. The Sun and the Serpent describes a journey of discovery by its two authors, Paul Broadhurst and the Scottish dowser Hamish Miller, along the entire St Michael line. They detected a peculiar form of energy, winding in a serpent fashion around the straight axis of the line, and they were able to trace it from Land's End as far as Avebury. There it made a complicated pattern around the monument and as Hamish Miller followed it with dowsing rods, he was surprised to find that it crossed another energy channel of a different quality. The new current was of opposite, negative charge and thus the counterpart to that of the first channel. 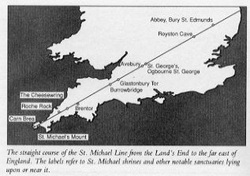 Further investigation revealed that there was in fact a double line of energy coiling around the St Michael line. The two researchers went back to the beginning and repeated their entire journey up to Avebury, tracking the path of the second channel. They then completed their work by following and mapping the routes of both the energy lines eastward to the North Sea. The two lines of current which spiral around the straight axis of the St Michael line form the symbol of the serpent-entwined rod of Asclepius, the Greek god of healing. These serpents represent the vital energies around the spine of the human body, and the meaning of the St Michael line is evidently similar. The line marks the backbone of southern England, energized by the vital currents of earth. The sanctuaries on its course where the two currents meet, such as Glastonbury and Avebury, can be seen as the 'chakra' or nodal points in the 'subtle body' of the landscape, its field of geomagnetic and other energies. Between these places, along the central spine of the country, wound an ancient trackway. It led to the national sanctuary at Avebury, where tribes gathered from afar for seasonal festivals, but it was not primarily a secular route. Every year the course of the line was trodden by certain members of a tribe, those in the process of initiation. A double pathway, one strand leading up the country and the other down, conducted them by wayside shrines to the Mystery centres where the two paths converged. 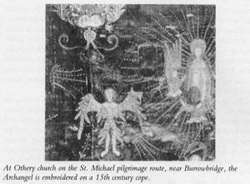 Their guide was the earth spirit, later identified with Hermes whose dual aspect is reflected in the twin, negative and positive currents of the St Michael line. On the high places along the axis of the line, beacon lights were tended by hermits who, as the word implies, were traditional servants of Hermes. This picture is imaginary, but it is composed of eternal poetic or archetypal images which, before the rise of civilized distractions, dominated the ancient mind and were imitated in the patterns and artifacts of ancient life. A succession of these images was encountered by those who walked the path of initiation. Every district they passed through was known as the scene of certain mythological episodes, and these were illustrated in the hills and folds of the local landscape, brought to life by the interplay of shadows and the light of the sun or moon. As the mythic journey unfolded, it was accompanied by a song which continued throughout its entire course. Thus the pilgrims' way was a chain of poetic images, composed of sun, moon and starlight, hills, vales and springs, local spirits and phantoms, mythological events and the songs of an unbroken linear chant. In sober fact, there is good evidence of an ancient pilgrims' way approximately on the St Michael line from Cornwall up to Avebury, and the extension of the line eastward follows the general course of the prehistoric Icknield Way into East Anglia. The western part of the line retains local traditions of a former pathway, first trodden by angels. There are even hints of a divine presence on the straight way from the west to the Isle of Avalon. In a book of essays, Michael, Prince of Heaven, the seer, Wellesley Tudor Pole, recorded a saying among West Somerset country people, that Jesus once walked the line from St Michael's Mount to Glastonbury, and that one day he will pass that way again. The time and form of his next appearance are unknown, but he must be made welcome, and every traveller should therefore be given hospitality. During their survey of the St Michael line, Broadhurst and Miller made a remarkable addition to the symbology of Glastonbury Tor. The first, positively charged line which they followed made a complicated spiral pattern on the sides of the Tor, including a long, thin loop around its level summit. When they returned to Glastonbury on the trail of the second line of opposite polarity, they found that this too made for the Tor and traced a pattern around it. The main feature of the second design was a bowl-shaped curve around the eastern flank of the hill, opposite the loop formed by the first line. Putting the two shapes together on a plan of the Tor produced a coherent and striking symbol, an image of sexual union, similar in meaning to the combination of light shaft and dark cave which was referred to earlier in connection with megalithic ritual. The discovery on the Tor of this symbol, created by a positive and a negative current of energy, confirms the tradition that Glastonbury Tor was a centre of the ancient mysteries.